This month Council had the opportunity to attend a Special CoRE event in Ballarat to celebrate the work of the Alliance and its achievements as part of the Victoria Against Violence initiative of the Victorian Government and the 16 Days of Activism campaign to end gender based violence, November 25 – December 10. Ararat Rural City Council representatives were joined by 100 others as CoRE celebrated the significant milestone of achieving 50 members in the first six months – all committed to taking action to end violence against women and children in the Grampians. 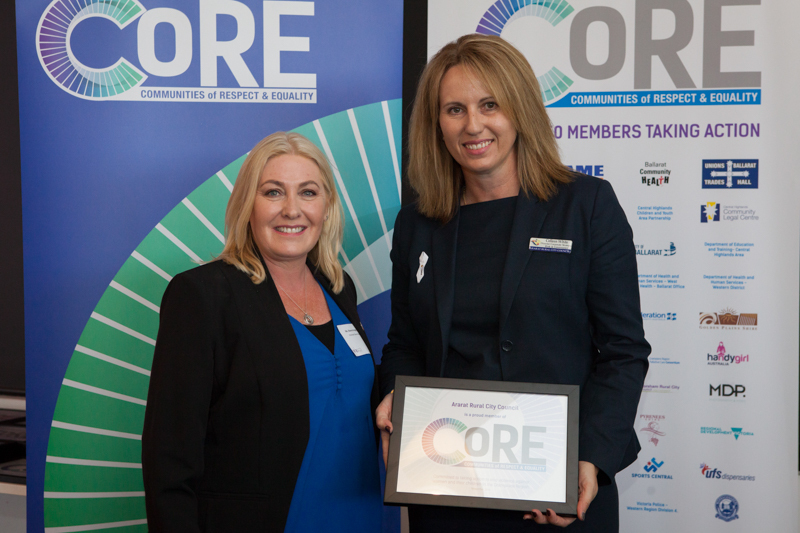 Ararat Rural City Council Director Corporate Strategy, Risk and Governance, Colleen White was there to receive recognition from Sharon Knight MP, Parliamentary Secretary for Human Services. “It was a great opportunity to meet other Alliance members and hear what they are doing, and planning, as part of their membership,” Ms White said. The CoRE Plan sets a vision for ‘a safe, equal and respectful society for everyone’ and invites all organisations, businesses, clubs and networks in the region, who share this vision, to become members of the Alliance and start working collectively, with mutually reinforcing actions towards that vision.